It's been a while since I uploaded my last book recommendations post, so I thought it was time I did a new one! Sticking with the seasonal theme, this time around I'm sharing my winter reading recommendations. All of these books honestly are great to read at anytime of year but I picked out the ones that I felt were great for curling up under a blanket with while it's cold outside, whether they have a wintery setting or not! If you're interested in those kinds of books, just keep reading! My first recommendation is a book I read earlier in the year and it ended up being one of the best things I've read all year– The Great Alone by Kristen Hannah– when thinking up this list, this one was quite an obvious choice, it's set in Alaska in 1974 onwards and the descriptions of life in the wild winter landscape just makes it, in my opinion, the perfect winter read. The Great Alone follows thirteen year old Leni as her Dad, a former POW in Vietnam, makes the decision to move the family to live off the grid in the wilderness of Alaska. Leni has to deal with the first dark dangerous winter whilst also being the middle of her parents passionate but equally dangerous relationship. It's such a beautiful story that keeps you on the edge of your seat, it's the perfect book to keep you entertained all day while it's raining outside. Recommend if; you like stories with interesting, dimensional characters, if you like YA and if you like beautiful landscape descriptions. Add The Great Alone on Goodreads. The Shadow of the Wind by Carlos Ruiz Zafon is one of those books that no matter how long it's been since you read it, as soon as you read the first few lines again it instantly transports you back into the story. If I could describe this story in one word it would be atmospheric, the whole mood and feeling of the story captured me from the first page and the mystery kept me hooked. It tells the story of Daniel who accidentally becomes involved with the secrets of post war Barcelona and especially those surrounding mysterious author Julian Carax. I don't want to give too much away because I think it's so much better going into the story if you don't know too much about it, but I've left the Goodreads link below if you want to find out more. It's definitley a book that would compliment a dark, winter's day. Recommend if; you enjoy mystery novels, you can relate to being obsessed by a book & if you want a story to really get lost in. Add The Shadow of the Wind on Goodreads. The next book on this list is a contemporary, beautiful, emotional rollercoaster of a story. A Little Life by Hanya Yanagihara is one of my all time favourites and one of the books I'm really hoping to reread– mainly because of the amazingly written four main characters, who's lives the story centres around. Despite the heartbreaking plot, I wanted to include it on this list because when I was thinking of books that reminded of winter, this immediately came to mind, to me the whole vibe of the plot reminds me of bleak but beautiful winter's day. As I said A Little Life follows four main characters living in New York, Willem, Jude, JB & Malcom and follows their lives and relationships with each other, which are darker and more complex than meets the eye. Again I don't really want to say much more than that & honestly that is, very basically what happens for the entire book, it's a character driven plot which is what made me enjoy it as much as I did. Before recommending though I want to just say before picking this book up to check the trigger warnings because of the sensitive subjects this book goes into. Recommend if; you like darker, more emotionally hard hitting stories, if you like characters with a lot of depth & if you enjoy beautifully written prose. Add A Little Life on Goodreads. For the last recommendation, I wanted to be something a little bit different and a little bit shorter too, so I'm going with Useless Magic by Florence Welch. This is a book of poetry and lyrics all written by Florence, of Florence + The Machine and as she is one of my absolute favourite artists as soon as I heard she was bringing out a book, I knew I had to get my hands on it straight away. Useless Magic features lyrics from every song from her four albums plus her poetry and art derived from her own sketchbook which is just absolutely beautiful. I think it's an obvious choice for a fan of Florence + The Machine, but even if you're not, its such a lovely book to look through and her writing is, of course, just as lovely. For some reason I always seem to gravitate towards poetry or more graphic novels during the winter so I thought I would include this one for anyone else who does too! Recommend if; you're looking for something a bit different to read, you like beautifully put together books & you want something to inspire you creatively for the new year. Add Useless Magic on Goodreads. 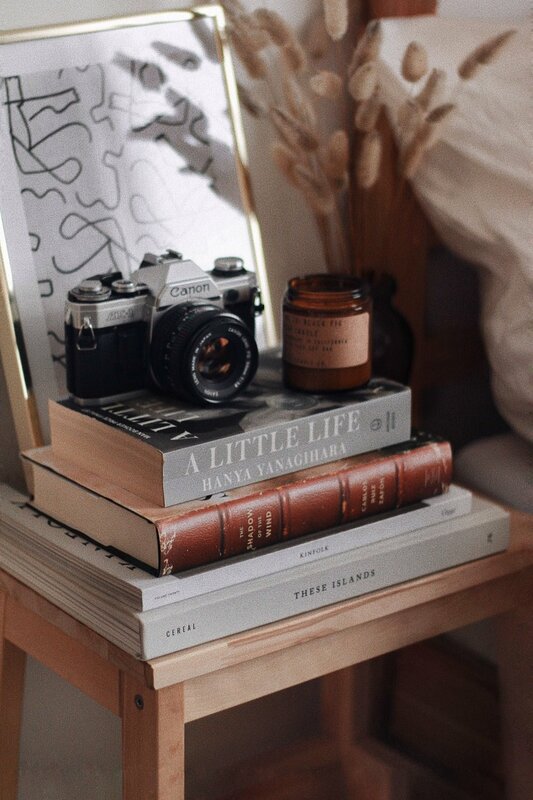 Before I wrap it up, I just wanted to quickly include an honourable mention to the book I'm currently reading– Burial Rites by Hannah Kent– as I think that if I had finished this book in time for this post going up, I definitely would have included it. I'm not officially recommending it, as it is I'm only about halfway through but I'm loving it so far and I think it makes for the perfect winter read. It's another historical novel, this time set in Iceland in 1829 so obviously it's got the bleak winter setting that some of the other recommendations have...I'll be sure to let you know my thoughts when I've finished it! Add Burial Rites on Goodreads. And those are my winter reading recommendations, I would love to know if this inspires any of you to pick up any of these books, so leave a comment or come and chat with me about them on Instagram. I'd also love to know your favourite wintery read as I'm always looking for new things to read! I hope you all have a lovely day!